The 25th World Economic Forum (WEF) on Africa was held in Cape Town, South Africa, between 3 June 2015 and 5 June 2015. Over 1,000 leaders from business, politics and civil society convened including South Africa’s current President, Jacob Zuma and former British Prime Minister, Gordon Brown. During the WEF, African political and business leaders made clear that transparent and accountable financial systems had to be promoted to aid social and economic rights such as education and healthcare for the continent’s youth. With Africa losing millions from illicit financial flows, the focus on economic growth has given rise to deep inequalities, pervasive poverty and struggling infrastructure despite the fact that Africa swims in mineral resources and a large labour market. 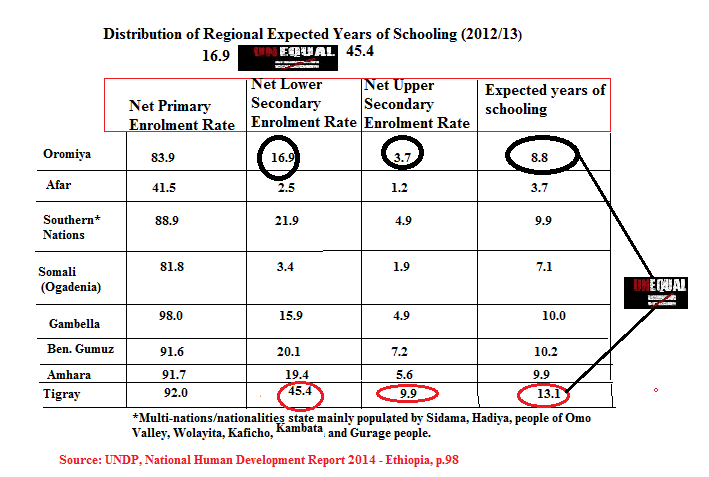 Posted by OromianEconomist in Africa, Economics, Economics: Development Theory and Policy applications, The extents and dimensions of poverty in Ethiopia. 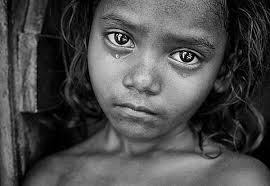 Poverty can be an outcome of inefficient use of common resources and a result of exclusive mechanisms. 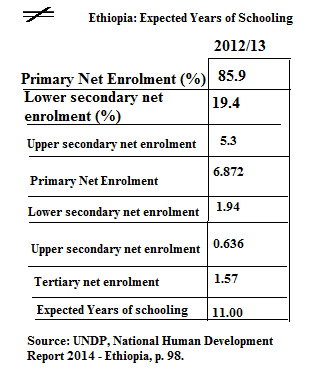 Weak policy environment, inadequate infrastructures, weak access to technology and credits can cause poverty. 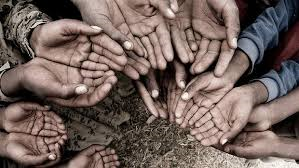 Poverty can also result from the use of mechanisms by some groups in a society or community to exclude others from participating in democratic and economic development process (Ajakaiye and Adeyeye, 2002). 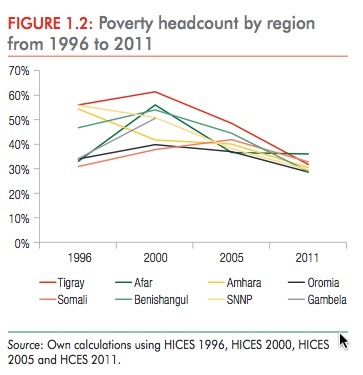 This is defined by Hazell and Haddad ( 2001) as social deprivation…From the different reasons mentioned above in relation to poverty in developing countries, it is clear that strategies to alleviate poverty and help poor people must aim at improving the productivity and the living conditions of smallholder farmers and landless agriculture workers who constitute the majority of poor people. Furthermore, agriculture is seen as central to rural development. It is the major economic driver, the hub of rural activities, and permanent estate (IRG, 2002). The improvement in agriculture productivity is based on agricultural research and improved technologies. In many developing counties government must play an important role in this domain. However poor people may benefit from agriculture productivity only if favorable macroeconomic and trade policies good infrastructure and access to credit, land, and markets is in place. As far as land is concerned, government in many developing countries must undertake land reform program not only for a better distribution of land but also to create mechanism capable to define and enforce property right. Land reform can promote smallholder entry into the market, reduce inequalities in land distribution, increase efficiency and thus boost output. The ubiquitous problem of poverty continues to confound development practitioners, politicians and researchers alike. In spite of countless efforts to eliminate poverty over the past decade, 2.5 billion people live on less than $2 a day and 880 million people still live on less than $1. Most of these depend on agriculture for their livelihoods (World Development Report, 2008). While some progress has been made in some countries, the ambitious goal of halving poverty by the year 2015 appears like it will not be achieved. The objective of this paper is to characterize the problem of poverty and attempt to proffer possible insights on pathways that may jettison the rural poor out of misery into prosperous economic agents with a brighter hope for the future. Posted by OromianEconomist in Africa Rising, African Poor, Corruption, Corruption in Africa, Free development vs authoritarian model, Illicit financial outflows from Ethiopia. 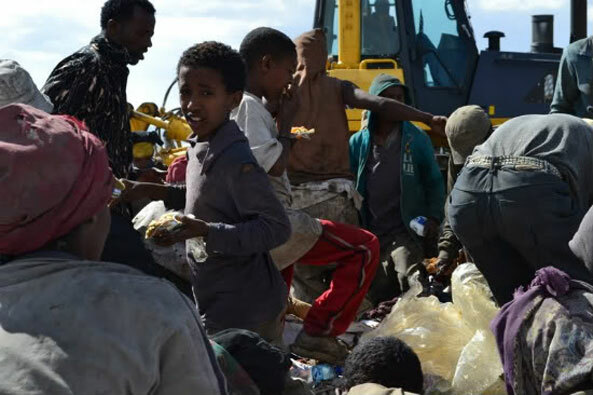 British journalist Caroline Knowles writes that Addis Ababa’s city dump (aka Koshe) as the main source of survival for many poor Ethiopians. 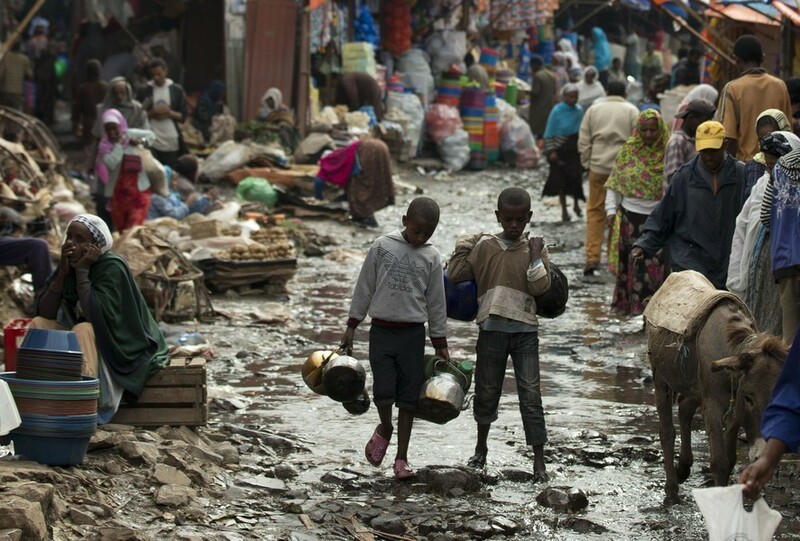 But, Why the Ethiopian government allow its people to live like this? Is it because they don’t know or because they don’t care? MY first sight of Koshe, Addis Ababa’s giant 50-year-old landfill site, is from the highway. It runs alongside it, and away from the road as far as the eye can see: a giant, murky, grey-brown raised area of partially decomposed rubbish, with occasional bright specks of colour. As my hopes rise from having found it, my heart sinks as I try to take it in. The interpreter I have engaged for this mission through my contacts, a junior academic at Addis Ababa University, is not keen on going ahead. Leaving the taxi and crossing the highway by the bridge, I try to absorb the panoramic view afforded by this elevated viewpoint over the highway. This 36-hectare site – shrinking as the city attempts to regulate it – is patrolled from the air by large vultures, diving into the rubbish. Motley crews of wild dogs gambolling and snatching at the soft ground patrol it at ground level. Smoke rises in several places, adding a layer of haze to the murky colour scheme. Yellow bulldozers nose the heap and shift and level it; municipal rubbish trucks and flatbed trucks with skips arrive from all over the city and discharge their contents. Between the dogs, the birds and the machines there was something else, something I could only slowly take in: 200 to 300 people, dressed in the same murky hues as the rubbish dump, backs bent, hooks in hand, were working on its surface. Feeling queasy I walk towards the end of the bridge. In order to reach the steps and the rubbish, I must walk past three young men who are using the vantage point of the bridge for surveillance and information gathering. In an unspoken negotiation I don’t understand, they take in my camera, and my shoulder bag containing digital recorders and money, and let me pass. This silent confrontation, between the comforts of my world and the difficulties of theirs, only further develops my anxieties. Descending the steps, I walk to the edge of the dump where I am met by the site supervisor and his aides. They want a stamped authorisation of my visit from the relevant municipal department. What looks like a vast area, open to the surrounding countryside, is as closed to me as a Korean petrochemical plant. I turn back and head into the city to secure the relevant authorisation. The city dump is an inventory, of a kind, of its material life. Addis in rubbish is not London or Moscow in rubbish. Rubbish provides a crude and deeply flawed account of cities and their social, political and economic contexts. Rubbish displays social, material and income differences. Indeed, some people’s rubbish provides others with the fabric of their everyday life. Maybe this is the best way to think about Koshe – as a redistribution centre which indexes the differences between people’s life-journeys, refracted through material cultures at their point of disposal. Not just the content, the handling of rubbish displays cities too. How cities deal with their rubbish reveals them. 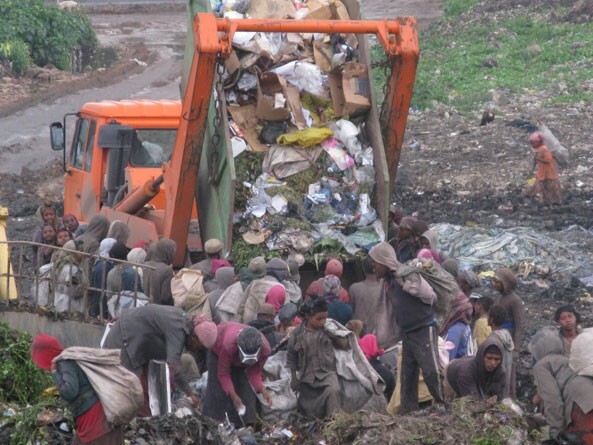 It is a major challenge for municipal authorities in Addis, who are only able to deal with two-thirds of the rubbish, distributed in collection points all over a city that is fast expanding – leaving the rest to private contractors and the age-old informal dumping practices on streets and in rivers. Thus rubbish provides a visual commentary on urban citizens’ behaviour as well as the efficacy of municipal governance. Getting myself into the rubbish is a story of municipal offices cluttered with old computers, fans, desks, officials and permissions. It is about writing a letter in Amharic explaining what I want to do and why. It is about waiting until the electricity comes back on and we can photocopy my university ID. There are phone calls to the landfill site and arrangements are made. Everybody is charming. I’ve come from London to take a look at the rubbish. Why? I am following a piece of plastic around the world. Really! First world problems! 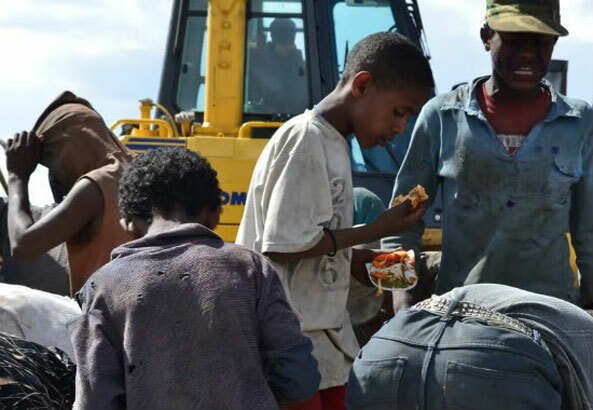 I go back to Koshe – which means ‘dirty’ in Amharic – and hand over the necessary papers to the site supervisor, in his makeshift office at the roadside of the dump. Minutes later, I am scrambling after him, out on to the rubbish heap, navigating around the dogs which I fear, and the areas where it is soft underfoot and I sink up to my knees. My stomach is churning with fear. My interpreter and I are using Olbas oil to mask the smell. We stop north of the main road, where it is firmer underfoot, in the area where the activity is concentrated. This is the place to which the municipal authorities and the site supervisor direct the trucks to dump their loads. A single white towelling slipper, with the Hilton Hotel logo on it, stands out in the grey-brown mush. This area is a hive of activity that peaks to a frenetic pace with the arrival of new loads, and then falls away, leaving a more continuous stream of slower activity, and a legacy of dust and smoke that gets in everyone’s eyes. As rubbish trucks turn off the main road on to the edge of the site, a group of five or six young men jump on the back and ride to the dumping area with it. This puts them at an advantage for grabbing the best items as the truck discharges its load onto the tip, but not without risk. The mechanism that crushes the rubbish occasionally catches a young man in its deadly and disfiguring grasp. As the young men jump off with the rubbish and begin picking items that catch the eye, the line of men and women, that has formed along both sides of the truck, spring into action, grabbing items and stashing them in woven plastic sacks. These are held tightly in one hand; in the other a homemade metal hook with a white handle, used to grab and dig into the grey-brown surface of the heap, is held. This hooked instrument earns the pickers – sometimes referred to as scavengers – the name ‘scratchers’. The moment of discharge unleashes a tense scramble for the most valuable items; a competition in which masculine physical strength prevails, and young, agile, women put up a good fight. Scratchers then go on searching, or rest until the next truck arrives, or regroup around the bulldozers unearthing new bounty. 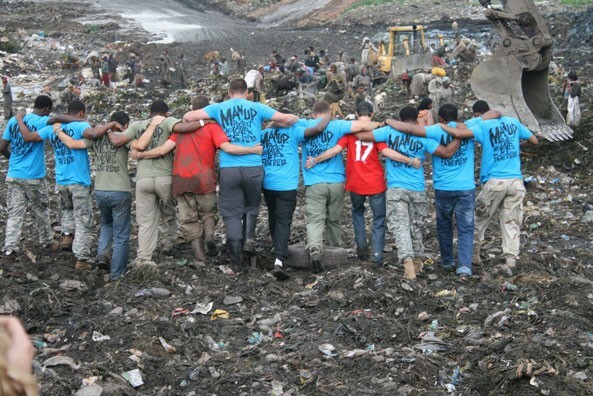 The social and material relationships of the dump demand skilled navigation. From the vantage point of the dump, the scratchers rework the geographies and hierarchies of the city. The tensest flurries of competitive scratching accompany the arrival of trucks from the most affluent areas, with the best rubbish. The Bole area, with its upscale detached housing, mall, hotels and the international airport, sends the most prized items, the cast-offs of affluence, including waste airline food in large green plastic bags, to the dump. Scratchers collect the food discarded by airline passengers for themselves, leaving a large pool of bright green plastic bags, which attracts a herd of goats. Rubbish from the central part of the city, from international hotels, the African Union HQ buildings and the embassies, is similarly sought after, and monopolised by the fittest young men. Scratchers recognise the sources of rubbish from the colours and types of trucks used by the different sub-cities and private contractors. And they recognise the drivers and their helpers, who regularly work the same areas. The discarded traces of the city’s more affluent lives, especially foreign residents and visitors, most animate the dump. Rubbish logs social inequalities in cities and provides a minimal redress. The dump has temporal rhythms. Scratchers know what time the trucks arrive from different parts of the city. From 8am through the morning is the busiest time. The dump is geared to municipal collection and transportation. By 5pm things are dying down as the trucks stop for the night, and the scratching continues with fewer scratchers at a slower pace. Bulldozers moving stuff around and digging into the surface of the dump also provide new scratching opportunities, and a lively crowd gathers around them. Scratching is a 24-hour activity, with people arriving after their working day is over. Some scratchers work throughout the night wearing torches attached to headbands. Scratching it seems is a (stigmatised) way of life as much as a way of getting by. Within the urban geographies of affluence, materials establish another set of hierarchies. Scratchers search for anything they can use for themselves, or resell. Materials have a value in recycling, providing an afterlife for discarded objects. Metals, including nails, are the most valuable booty, and men dominate this, although a few women have ventured into metals too. Wood has value as firewood. Tourist clothes and shoes can be cashed in at the Mercato salvage section. Some scratchers just come to eat. But plastics are the most ubiquitous material on the dump, and among plastics, water bottles the scratchers refer to as ‘highland’, after a popular brand of bottled water, dominate, and in this niche women prevail. Scratchers specialise in particular materials. Specialisms result from advice from experienced scratchers, from serendipity, or from knowledge of shifting recycling prices, gathered at the edge of the dump. Here materials are counted or weighed, and turned into cash, with the agents from factories using recycled materials. A pile of white dusty material arrives from the leather factory. The dogs take up residence. They are ejected by a group of men, who have decided that this is a good place to sit, while waiting for the next truck. In their working clothes – they scrub up outside of work and look completely different – scratchers are dressed similarly and grimily, making them the same colour as the rubbish heap. Men wear trousers, shirts and tee shirts, baseball caps and sometimes hoodies to protect their heads from the sun. Women wear scarves and baseball caps, skirts, trousers, t-shirts and blouses. Some carry infants on their backs. All wear sturdy shoes, often trainers. The scratching population numbers 200–300, but expands after holidays with casual pickers. More women than men do it by a ratio of about three to one, and, while people in their 20s and 30s predominate, ages range from teens to seniors. Most live in the villages around the dump in simple, rusted, corrugated iron dwellings, sometimes with satellite dishes. Rubbish has provided a source of local employment and subsistence for generations over its 50-year history, and is firmly embedded in local calculations of subsistence and accumulation. About 50 scratchers live in cardboard and plastic makeshift shelters off the edge of the dump, safely away from passing vehicles and next to a pen full of pigs. The rubbish sustains rural arrivals, for whom it works as a gateway to the city, as well as long-term residents, whose rural routes have settled into the past, making them locals. In living beyond formal systems of governance, this city suburb of rubbish is more like the Somali borderlands, patrolled by contrabandists and gunrunners, than a part of the city. There is a police station nearby, and policing and the justice system are slowly taking back the dump from a parallel system of authority, a mafia of five ‘big men’. The big men control access by scratchers in exchange for fees, making themselves wealthy in the process. But recently, some of them have been imprisoned, shifting the balance of power towards the authorities. Once far away, a place outside of the city, outside systems of formal employment, taxation, law and municipal governance, Koshe is now on the edge of a city that has grown to meet it in what are fast becoming its upscale southern suburbs. A new development of large detached houses nearby anticipates this future – new housing for those in a position to benefit from rising prosperity, and a consequent shrinkage and rehabilitation of the landfill site. These changes have far-reaching consequences for the scratchers of Koshe. 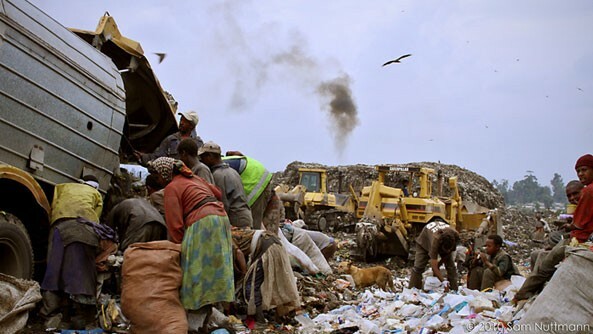 NOTE: The above article was first published on The Guardian Newspaper under the title “Inside Addis Ababa’s Koshe Rubbish Tip Where Hundreds Literally Scratch a Living”. It is an extract from the new book Flip-Flop: A Journey Through Globalisation’s Backroads by Caroline Knowles. (Pluto Press, £18.99). Posted by OromianEconomist in Africa, African Poor, Colonizing Structure, Corruption, Development, Development & Change, Economics: Development Theory and Policy applications, Ethiopia's Colonizing Structure and the Development Problems of People of Oromia, Afar, Ogaden, Sidama, Southern Ethiopia and the Omo Valley, Poverty, UN's New Sustainable Development Goals, Youth Unemployment. The truth is that humanity must now confront, not just poverty, but a convergence of mega crises, all of which are deeply interconnected: Government corruption; ecological destabilization; structural debt; and hyper-consumerism established in the west and rapidly expanding worldwide. Right now, a long and complicated process is underway to replace the UN Millennium Development Goals (MDGs), which expire in 2015, with new Sustainable Development Goals (SDGs). These will set the parameters for international development for the next 15 years and every government, UN agency, large corporation and NGO, not to mention billions of citizens on the planet have a stake. The best evidence of where the SDGs are starting from is the so-called “Zero Draft” document, first released on 3 June and currently undergoing exhaustive consultation. 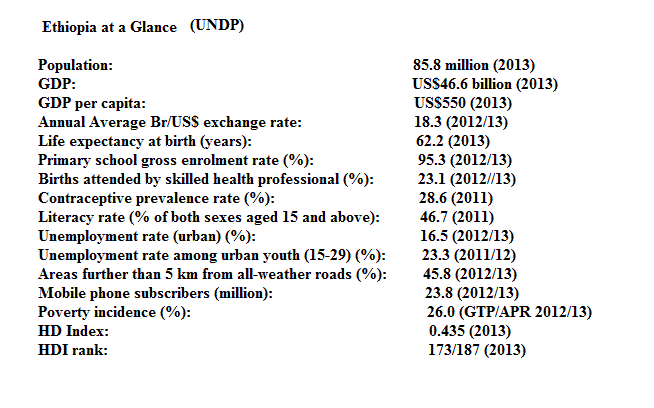 First things to note are the big differences with the MDGs. Most strikingly, the SDGs suggest an end to poverty is possible in the next 15 years, whereas the MDGs aimed at halving it. The implication is that we’ve made amazing progress and are now on the home stretch. Secondly, the SDGs get serious about climate change. This is a major paradigm shift and, what’s more, they aim squarely at the heart of the problem: patterns of production and consumption. Impressive. Thirdly, reducing inequality “within and between” countries is included, with a goal of its own. This suggests another paradigm shift, and a controversial one because it opens the door, just a crack, to the idea that the extremely rich might be making an undue amount of their money off the backs of the extremely poor. Of these three goals, it is fairly certain that two will disappear before the process concludes. There is no way the world’s rich governments and corporations will allow a meaningful challenge to production and consumption patterns, or a focus on reducing inequality. This is a given. However, there is an even more important problem in the Zero Draft document which is that the very starting point of the issue is profoundly misconceived. How do we know? Because of the language. Language is a code that contains a lot more than its literal meaning, and an analysis of semantic frames in the Zero Draft exposes the logic upon which it is built. Poverty can be conceptualised in many ways and in this passage it is presented as both a preventable disease (“to be eradicated”) and as a prison (“to free humanity from”). In both, the framing reveals the framers’ view, conscious or otherwise, on causation. Diseases are just part of the natural world, so if poverty is a disease, it suggest that it is something for which no-one is to blame. The logic of a prison meanwhile is that people are in it for committing a crime. The former denies the idea that human actions may be a cause of inequality and poverty; the latter invokes the idea that poverty is the fault – the crime – of the poor. Also note the phrase: “the greatest global challenge.” This asserts a logic in which there is a hierarchy of individual issues based on relative importance, with poverty at the top. The truth, however, is that humanity must confront a convergence of mega-crises all of which are deeply interconnected. Government corruption, ecological destabilisation, structural debt, hyper-consumerism established in the West and rapidly expanding in the east and south, for example, are all closely linked. But framing poverty as “the greatest global challenge” conceals the web of interconnected systems and removes them from consideration. The result: No systemic solutions can arise from a logic that denies systemic problems. There is a good reason for this: it protects the status quo. This logic validates the current system and ordering of power by excusing it of blame and says it can, indeed must, continue business as usual. This is the logic of the corporate capitalist system. There’s no denying that some excellent progress has been made since 1990 – the year the MDGs measure from – but you don’t need to deny that to know there is something fundamentally wrong with a global economy in which, at a time when wealth grew by 66%, the ratio of average incomes of the richest 5% and the poorest 20% rose from 202:1 to 275:1. Or that the reality masked by the ratios is that one third of all deaths since 1990 (432 million) have been poverty-related. Using UN figures, that’s more than double the combined deaths from the Two World Wars, Mao’s Great Leap Forward, Stalin’s purges, and all military and civilian deaths from the wars in Korea, Vietnam, Afghanistan and Iraq. What’s more, even though we are now seeing around 400,000 deaths every year from climate change, we are pumping 61% more greenhouse gasses into the atmosphere annually than we were in 1990. The point is that, in light of the logic the language exposes – and we have mentioned just two of many possible examples telling the same story – any glorification of the SDGs we hear over the next year must be seen as reinforcing the logic their language contains. To really tackle poverty, inequality and climate change, we would need to change that logic to one that is built on an acceptance of how much these problems are the result of human actions. And that the fact of living in poverty makes no inherent comment whatsoever on the person or people concerned, other than that they live in poverty. This in turn would make a wholly different type and scale of change feel like common sense. For example, it would feel obvious to work towards taxing carbon emissions at source and putting in place sanctions against those responsible for hoardingat least $26 trillion in tax havens. We would instinctively reach to introduce laws that give local authorities everywhere the right to revoke corporate charters for serious social or environmental misdeeds anywhere. And the big one: money. Ridiculous though it may sound, right now we allow private banks to control the supply of US dollars, euros and other major currencies that surge through the global economy. These banks charge everyone, including governments, interest on every note, thereby guaranteeing that a constant river of money flows into their coffers, along with immense power. But unfortunately, none of these issues will make it into the SDGs because they contradict the current, dominant logic, and what’s more, because they might actually work and redistribute power and wealth more equitably. We compound our problems when we allow ourselves to be drawn into processes like the SDG-design are turning out to be. Every ounce of credence given to their frames helps weigh down the center of debate far from where it needs to be. Until the UN can use its powers, resources and privileges to promote policies that grow from the logic of its highest ideals, we may help it, the planet and each other best by divesting our attention from it and finding avenues for change that can.